NOTE : Due to a change in the Digital Assets format in Houdini 14, the Digital Assets will only work in H14. However the lessons can be followed and recreated in any version above Houdini 12. This training is primarily aimed at users at an intermediate level. This training is a continuation of the Texture Building Series. In this series we take a look at how to convert shader trees into usable Digital Assets. The purpose of the training is to help simplify the material building process in Houdini. 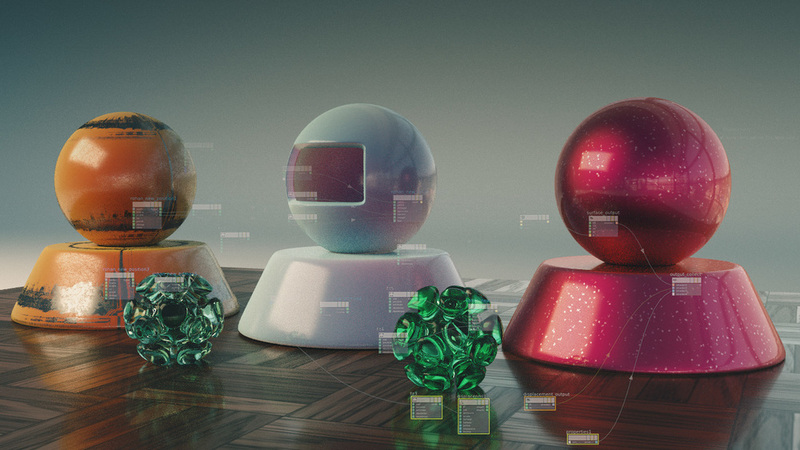 We take the PBR shader nodes and convert those into usable Digital Assets that we can then use in production. We also make digital assets to help make the day to day workflow of shader building simpler. The training is split in two parts. In the first section we start by converting the daily mapping tasks in Digital Assets such as, UV mapping, Gradient Ramps and other maps. We then also look at creating a Digital Asset out of a more custom built map/texture. Tiles asset - We create a custom tiles map to replicate the Tile map functionality from 3dsmax and them convert it into a usable Digital asset. Diffuse, SS and Self Illumination - We start by creating a combined node for Diffuse, SSS. Self Illumination and Opacity. Specular Shader - Creating a usable Digital Asset out of the PBR Specular node. Refraction Shader- We create a fully usable Refraction Shader which also includes Attenuation Density and Fake Caustics. Material Tests - In the final lesson we create a few complex shaders using all the various shaders and maps that we have built over the duration of the training.